In a pot, heat the oil over medium high heat. Add the onions and garlic, and cook until translucent. Incorporate the tomato and yellow pepper paste, and sauté for 2 minutes. Incorporate the potatoes, barley and vegetable broth. Bring to a boil, then lower the heat to medium low and cook half-covered for 30 minutes or until the potatoes and barley are tender. Add the fava beans and cook for another 10 minutes. Season with salt and pepper. Turn off the heat and incorporate the feta cheese. Serve the chupe in soup bowls. Add a tablespoon of Greek yogurt to each bowl and sprinkle with chives. Serve immediately. Instead of yogurt, you can add 1/2 cup of evaporated milk with the feta cheese. You can heat up the soup, but don't let it come to a boil or the evaporated milk will curdle. If you'd like a heartier chupe, lightly beat two eggs and add them to the soup before turning off the heat. This will give it even more consistency. This chupe gets better if you let it rest. Preparing it in the evening and having it for lunch the next day is a good idea. It will be much tastier. If you have fresh cheese at home, use that instead of feta. Morena Cuadra This is a traditional soup in the Peruvian, Ecuadorian and Bolivian Andes. 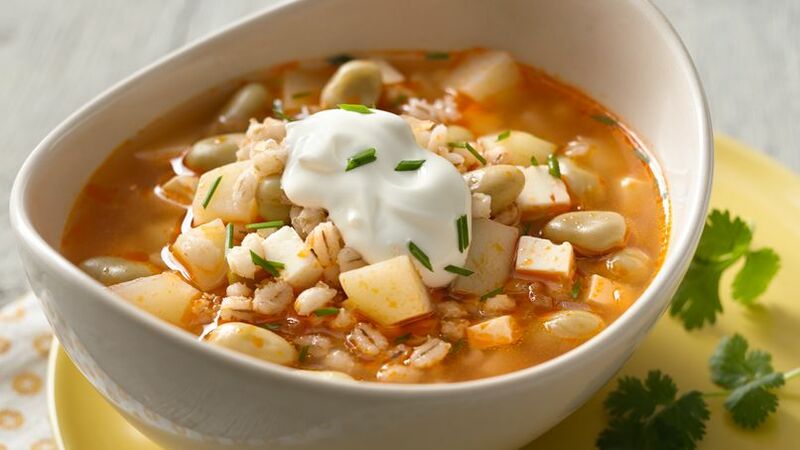 The fresh fava beans and barley are delicious and have a high fiber content which, along with the potatoes, makes it a very complete and comforting meal, especially when it's cold outside. Since very ancient times, we have consumed different types of soups in our countries, using many of our native ingredients. Chupe, a stew with a thick consistency, almost always takes some sort of mixed vegetables. The last ingredient is usually some evaporated milk, but instead I used a tablespoon of Greek yogurt to make it lighter. Rokros is another type of Andean soup, which is much thicker than chupes and mostly made with vegetables. This is where the famous locro comes from, which is served in Peru as a squash stew instead of a soup. Lastly, we have lawas, very light vegetable soups.